Shuteye Ridge is a place I love sharing with people. It has crazy interesting granite unlike I’ve seen anywhere else with its dark runnels and plates of knobs. It is also the place I lead sport for the first time, went on my first multi-pitch and placed my first trad gear (all in one trip!). 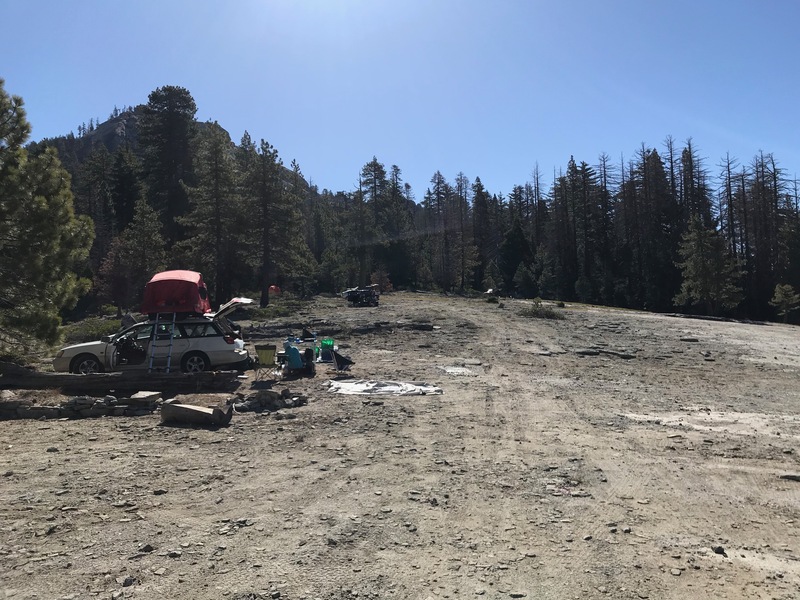 On a Memorial Day weekend when you cannot seem to get away from traffic and people, even one of the most popular areas of Shuteye (Big Sleep) was a respite. Yes, there was a ten car group of 4×4’ers and a few other groups out on the big sleep slab camp area. However, we never waited in line and most of the time were completely on our own or only ‘near’ one other party. With a potential for moisture, we decided to save the Big Sleep Dome for Sunday and ascend up Shuteye Pass Trail towards The Eagle’s Nest. 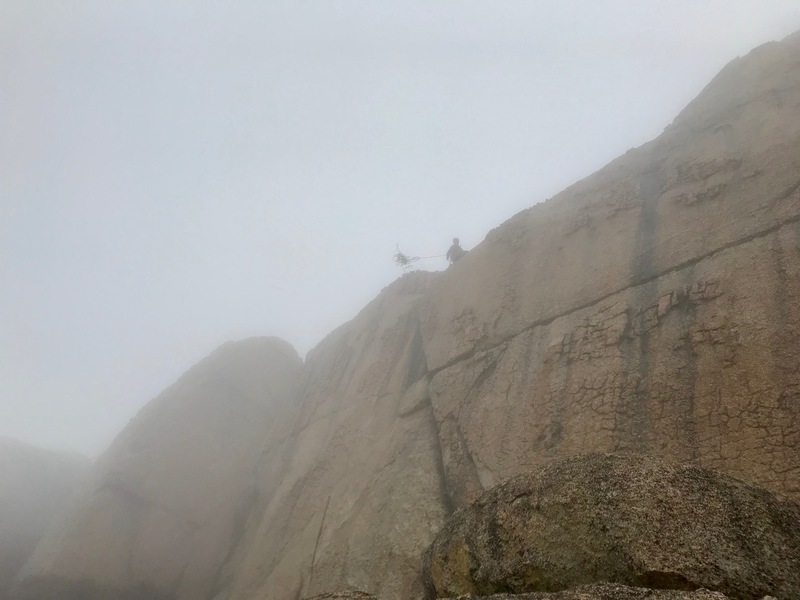 It started clear enough for us to check out the routes, but shortly clouds descended upon us, shrouding us in a foggy wisp. The Eagle’s Nest for 10 minutes before clouds rolled in. The Eagle’s Nest after clouds rolled in. Sadie throwing the rope before rappel. Warming up on some classic 5.8 knobs and 10a runnel was enticing enough for Natalie and Jeremy to set up a top rope on a 5.12a. Shuteye has everything from top ropeable 13s to 5.7s. 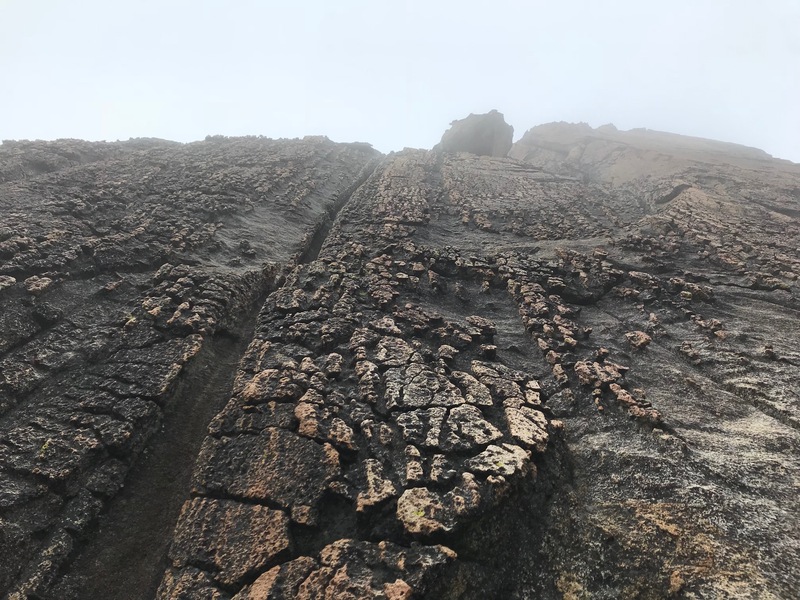 After a little encouragement, I too decided to give it a go and was thoroughly shut down through the harder sections, unable to get enough pull off small features while contorting my body to remain in balance. View of the 12a from a much easier route. Goes up the broken out sections, mainly on the right side. 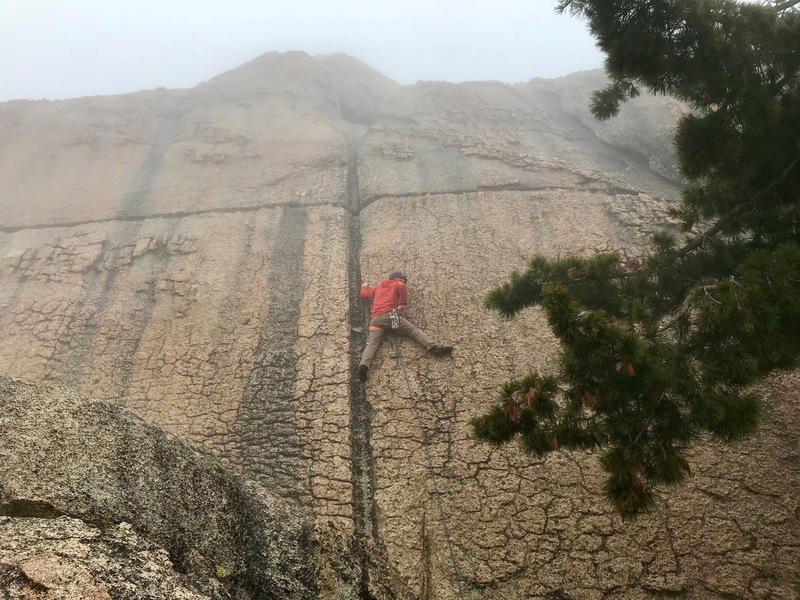 After a typical Shuteye bushwhack trying to find a trail between features from Eagle’s Nest, we arrived at the ridiculously knob plated Runnel Vision Wall. Runnel Lust felt like a romp and Runnel Vision was wonderful. It started getting darker and we assumed that meant the sun was going down since it was still hidden behind a layer of cloud. I’m not only getting Runnel Vision, I’m getting Plate Vision! The second day we had much lower chance of weather so we headed out to climb the Moonlight Madness classic up Big Sleep Dome. 5 pitches of pure slab climbing at mostly 5.7, it was a good experience in finding feet in small divots. Another party on runout 5.7 PG13 Afternoon Nap. After a nut-butter and apple lunch on top of the dome, we took another less traveled connection trail through bushes down to Voodoo. 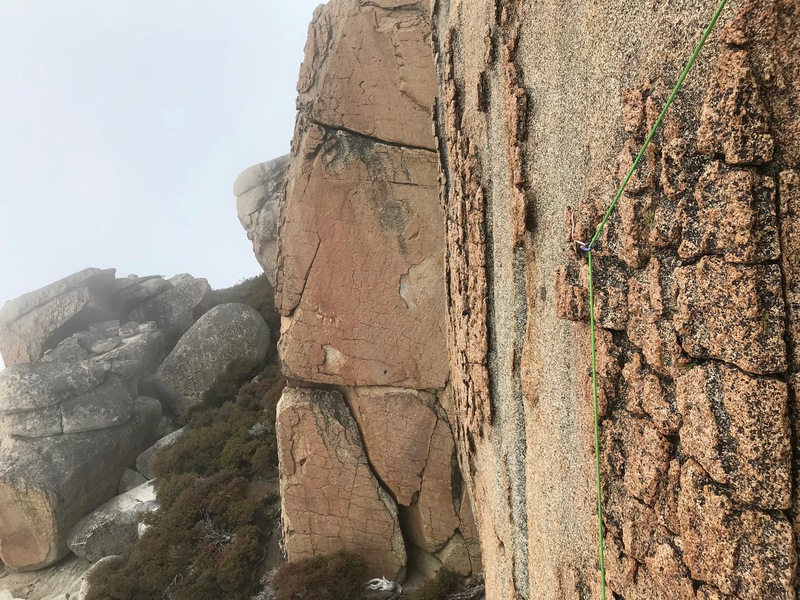 Natalie had her eye on an 11b fingers there, but when we arrived we were looking at a wet, mossy, slimy chimney followed by a gaping off width for the first pitch. 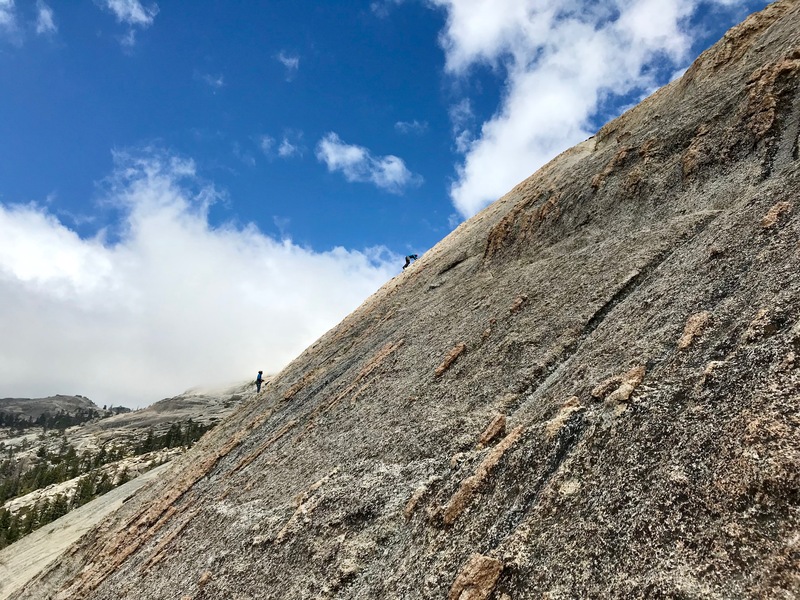 Jeremy groaned his way up this 5.9 basically without protection as the book’s gear recommendations were too small for the crack. The off width about 20 ft up past the slime and grime. Meanwhile I went up a ‘classic’ 5.9 bushmaster that offered poor protection in its flared and brittle looking crack systems. The route was varied, but not a killer crack like the book sold me on. The pitch was a full 60m and I had to build an intermediate anchor off knobs and a button head bolt as backup to get back down. Having experienced what looked like bomber knobs snap off and button head bolts whose internal pin was completely corroded, I chose to combine the two to give me some sanity for my rappel downwards. We ended the day by rapping into “Voodoo Right Side” to set up top rope upon some burly anchors on a ‘laser cut’ crack moving from fingers to hands before a massive roof. 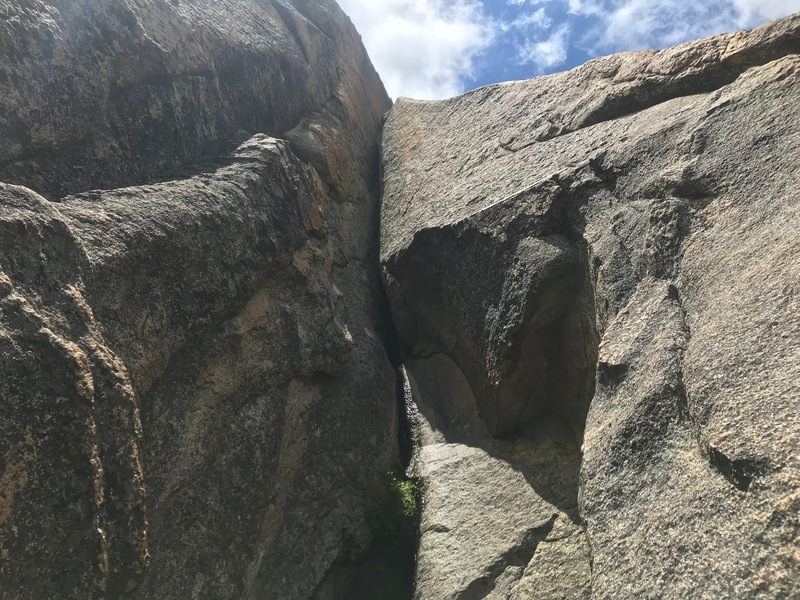 I actually did pretty well in the crack, but the crux was wild. It required a heel hook combined with a solid hand jam to pull myself up and over from inversion. I cannot imagine pulling that on lead, but it was amazing on top rope. 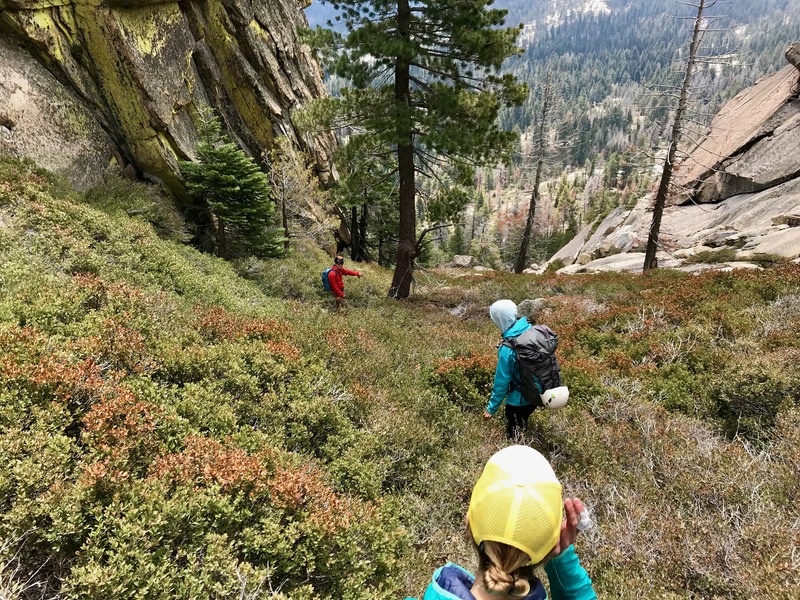 The hike out provided a view of Natalie lead the 11b section on top of Voodoo before descending to start dinner, build a fire and have a well-earned beer. The next morning Jeremy and Sadie took off for their sweltering week in Indian Creek while Natalie and I got a half day of climbing in. Nothing was really a short approach, so we headed up one of the remaining features we had yet to visit. Crocodile Dome hosted some high quality, hard sport routes in the middle but more moderate, pure crack routes on either side. 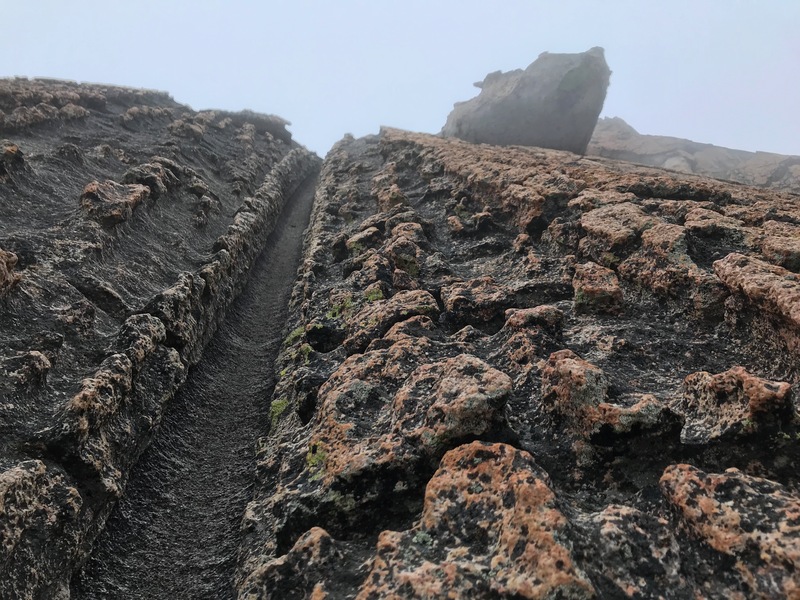 Again, a classic moderate crack route surprised me in its strange style as I headed up an awkward crack comprised of two slices focusing into a wedge that flared behind it. This made protection strange as I lie backed it up to an airy traverse under the roof to join a hand-sized runnel to finish. The rightmost 10a, however, redeemed cracks at Shuteye with an awesome finger sequence up to an awkward hands / lie back to the anchors. Top roping the 10c PG13 next to it I successfully danced my way to the chains to end the day on a solid, confidence-inspiring note. There is so much climbing at Shuteye, most if it not on the web and only found in the guidebook. 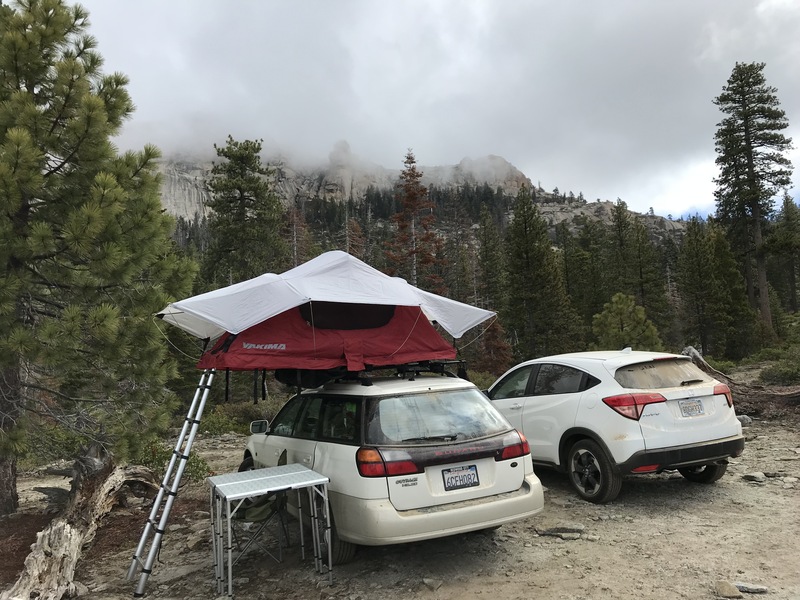 The ability to set up your car-camp and walk to different features with little crowding and very little regulations is so enjoyable. It was the textbook dream I had for my last year of climbing out of a car, even though I rarely achieved it on the road. It can be far from the bay and have its access issues due to road conditions but it well worth the trip. Definitely one of my favorite places in California. Our campsite for the weekend.